Okay, not exactly a cartoon, but I see this sticker grafitti stuck to a wall-ashtray everytime I go to Commerce downtown. It’s just so happy! I mean, I know it’s grafitti…but it’s adorable. 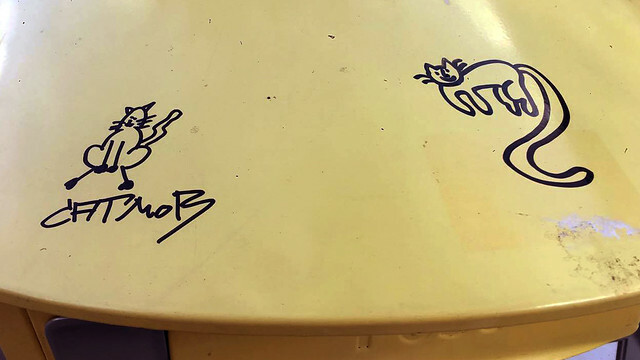 They also hit a postbox with a Sharpie, and this time Cat Mob has a friend. I really love his tail. I have no idea what or who Cat Mob is, but I appreciate their mascots. Now I’m curious about this “Cat Mob”!